Revolutionary new virtual reality technology could let anyone ride along with you as a virtual passenger. Called Voyage XR, it’s expected to have a range of applications, from training truck drivers to letting parents keep an eye on teen drivers while they’re on the road. And it could even enable far-flung, elderly relatives to ride along with family members from any corner of the globe. The Paris-based automotive supplier set up shop at CES with demos of Voyage XR, along with an eye-catching self-driving car test track across from the Las Vegas Convention Center. Voyage XR takes advantage of Valeo’s advanced sensors, cameras and telematics to ‘teleport’ someone into the car with you. While in autonomous mode, the user can pull up their contacts by pressing a button on the steering wheel. From there, they choose a contact and give them a call. A faraway friend or family member then takes the call and puts on a virtual reality headset, which immediately gives them a firsthand, immersive view of what it would look like were they to actually be inside the vehicle. The person in the front seat glances in the rear-view mirror and can see a virtual passenger, represented by a look-a-like avatar. 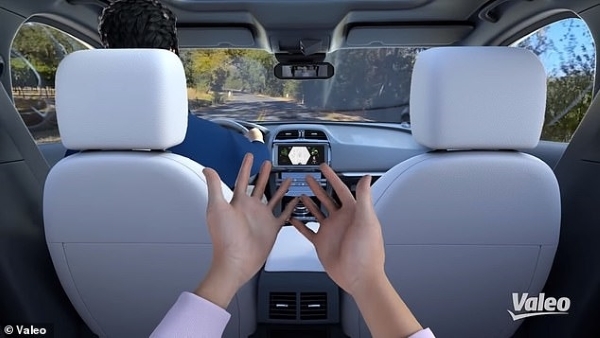 In addition to a headset, the virtual passenger can use a pair of controllers to interact with the driver, adjust their view and even select photos to beam onto the car’s touchscreen console. The system is equipped with digital array microphones and advanced signal processing that allows the virtual passenger to talk to the driver and vice versa. ‘[Voyage XR] makes it possible to virtually transport a person inside a vehicle,’ Valeo explained. ‘This innovation has led Valeo to imagine a unique experience: tele-transporting your loved ones on board. ‘Thanks to a wide range of technologies developed by the group (cameras, sensors, telematics, human-machine interface …), Valeo Voyage XR creates the illusion that a person of your choice, located outside the vehicle, is by your side. ‘The individual’s avatar appears in the rear-view mirror and you can both interact using sound and image in real time,’ the firm added. Voyage XR is also being used to improve safety while autonomous vehicles are on the road. The system, along with Valeo’s Drive4U Remote technology, can enable a safety driver to step in when there’s an extreme emergency. ‘Anything can happen on the road, from sudden severe weather conditions to an unexpected medical problem, which is when being able to take remote control of a vehicle is a relevant and necessary option,’ the company said. For example, autonomous vehicles learn that some actions are illegal or unsafe, such as crossing over a double-yellow line on the road. With Drive4U Remote, a remote human driver could be contacted and then take over so that the car can safely navigate an obstacle. Valeo was just one of several companies at CES that is aiming to put AR and VR in the car. Audi and Disney grabbed attendees’ attention with their debut of a new ‘Holoride’ system that aims to bring virtual reality to every car, including Ford, Mercedes and other models. Using an Oculus Rift headset, passengers can be transported into virtual reality environments inside a moving E-Tron crossover SUV.